The highly awaited trailer of Aamir Khan starrer Dangal released earlier this morning. The audience, critics and the film industry haven’t stopped raving about the biopic since. The film is a biopic on the wrestler and coach Mahavir Singh Phogat who trained his daughters to become professional wrestlers. Aamir Khan had spent months learning about the former wrestler’s journey. Joining the bandwagon of praises, Mahavir Singh Phogat and daughter Ritu Phogat expressed their views after watching the trailer. Both of them absolutely loved it and praised it. “Mahri chhoriya chhoro se kam hai k” ???????????????? The trailer of Dangal packs a punch and straight away hits the right chords. 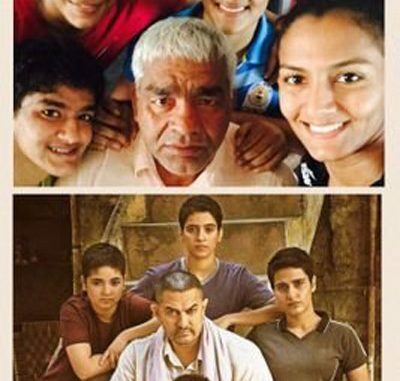 Aamir Khan is seen as a father of daughters who dreams to win a gold medal in wrestling for India. The film also stars Sakshi Tanwar, Fatima Sana Sheikh and Sanya Malhotra and is scheduled to release on December 23.